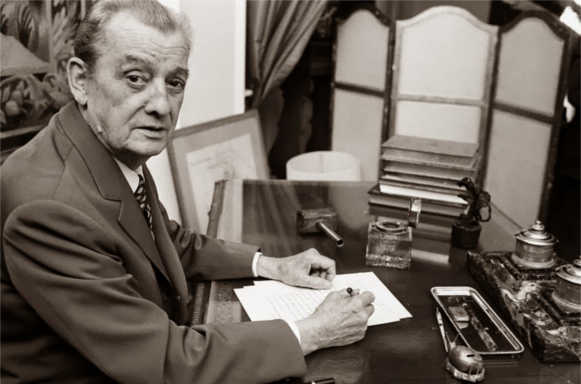 Twentieth century French literature and art cannot be considered complete without the contribution of an eminent playwright, novelist and filmmaker, Marcel Pagnol. His versatility knew no bounds as he was the master of magnificent and meticulous craft regardless of genre. On February 28, 1895 in Aubagne, France, Pagnol was born to Joseph Pagnol, a school teacher and Augustine Lansot, a seamstress. His family were descendents of Spanish swordsmiths. His father was appointed a teacher in a prominent school of Marseilles, thus his family moved to Saint-Loup when he was three years old. He learned to read at a very early age, but his mother’s irrational fear of reading resulting in cerebral explosion kept him from doing so, until he was six. In 1910, his mother passed away when she succumbed to a chest infection. Pagnol took his baccalaureate in philosophy in 1913. He then went on to attend the University of Aix-en-Provence majoring in literature. While studying he founded a literary magazine, Fantasio later renamed as Les cahiers du Sud, which would become one of the foremost magazines of the era. His early poetry appeared in the magazine, along with a play Catulle and a novel, The Little Girl With The Dark Eyes. Upon the outbreak of World War I, he was conscripted into army but his weak constitution had him discharged. In 1916, Pagnol married Simone Colin and the same year received his graduation degree in English. He followed his father’s footsteps and became an English teacher, delivering lectures at multiple local colleges. Subsequently, he moved to Paris in 1922, teaching for another five years before he took up playwriting. He joined a group of young writers and co-authored the play Merchants of Glory with Paul Nivoix. In 1928, he penned a satirical play, titled Topaze, about ambition. His play Marius, set in Provence is marked as his first work to be adapted for the silver screen. In 1926, Pagnol had the opportunity to attend the screening of first talking film on his trip to London. The silver screen fascinated him so much so that he decided to invest his creative energy in the cinematic world. On his suggestion Paramount Picture studios adapted his play Marius into a talking film, which became enormously successful and popular. A year after its release, Pagnol established his own film production studio. He developed a host of films over the decade, functioning as screenwriter, director, and financier and hired the cream of French film industry for acting. He became the first filmmaker in 1946, to receive the honour of being elected to the Académie française. The themes of his plays and dramas mostly centered on the issue of unmarried mother and the illegitimate child. Despite dealing with such scandalous issues, the treatment of his literary work remained clichéd and unquestioning of French patriarchal attitude. Subsequent to his second marriage and death of a child, Pagnol returned to literary writing. However, this time he explored the genre of novel. He produced multitude of novels of autobiographical nature. He penned down, Souvenirs d’enfance, inspired by his childhood experience. The series received rave reviews from the audience for the first two books; La Gloire de mon père and Le château de ma mere. Another series, The Water of the Hills, set in the early twentieth century Provence, deals with the theme of betrayal, deception and revenge. Furthermore, Pagnol had also famously translated some of the Shakespeare’s plays in French. Died in 1974, Marcel Pagnol was interred at the cemetery La Treille in Marseille.